Pressure Cooker is the process of cooking food, using water or other cooking liquid, in a sealed vessel, known as a Pressure Cooker. Pressure Cookers are used for cooking food more quickly than conventional cooking methods, which also saves energy. Pressure is created initially by boiling a liquid such as water or broth inside the closed Pressure Cooker. The trapped steam increases the internal pressure and temperature. After use, the pressure is slowly released so that the vessel can be safely opened. We offer Aluminum Pressure Cooker 3 Ltr that have been specifically designed for commercial usage. These are compatible with induction stoves. These are specifically designed to cook food in large quantities. These are unbreakable and safe. Their large handles enable easy handling. We make these available at standard prices. 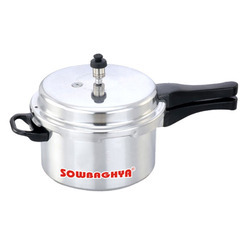 We make Aluminum Pressure Cooker 5 Ltr available at competitive prices. These have a high volume capacity which enables large scale cooking with ease. These are mainly used for commercial purposes.They have been designed to enable easy handling. They are light in weight and have been manufactured using food grade materials. 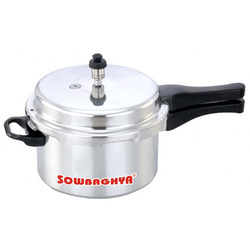 Aluminium Pressure Cooker 7.5 Ltr are usually safe and cheaper as compared to others. These are long lasting and are available at an affordable price. They are accurately designed and are apt for use in both commercial as well as in domestic settings. They have been created using food grade aluminium and allied materials. 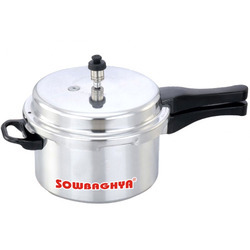 Sowbaghya - Induction Base Aluminium Pressure Cooker. Make your cooking experience even more special with this Sowbaghya Elite pressure cooker in both induction stove and gas stove. This cooker is a must have addition to your cooker collection. 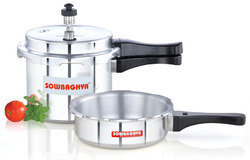 This brings to you a classic range of cookers from the house of Sowbaghya. The high quality cooker made of aluminium is sure to suit your preference. Looking for Pressure Cooker and Induction ?